“Your not going to believe this --- Just got this WW2 (now-declassified) Secret Document from the Narc(s). . . . It seems that they tried to use Medical Marihuana as truth serum at the time. . . . Humm. . which brings up the point, . . why weren't the narc's worried about bestial acts of violence committed by the prisoners while under the influence (of the killer drug, the weed of madness, the assassin of youth, the . . .) --- Maybe they knew something that we don't? Source of information: Stanford University Library – George White collection. 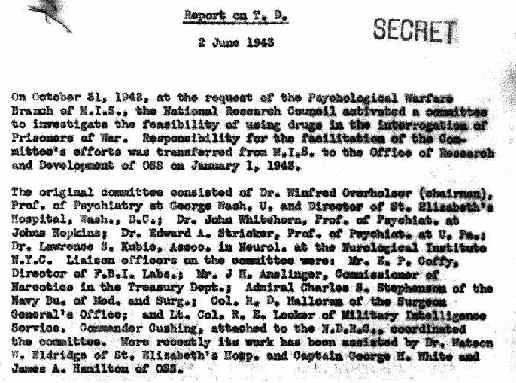 On October 31, 1942, at the request or the Psychological Warfare Branch of M.I.S., the National Research Council activated a committee to investigate the feasibility of using drugs in the interrogation of Prisoners of War. Responsibility for the facilitation of the Committee's efforts was transferred from M.I.S. to the Office of Research and Development of OSS on January 1, 1943. The original committee consisted of Dr. Winfred Overholser (chairman), Prof. of Psychiatry at George Wash. U. and Director of St. Elizabeth's Hospital, Wash., D.C.; Dr. John Whitehorn, Prof. of Psychiat, at Johns Hopkins; Dr. Edward A. Stricker, Prof. of Psychiat. at U. Pa.; Dr. Lawrence S. Kubie, Assoc. in Neurol. at the Nurological Institute N.Y.C. Liaison officers on the committee were: Mr. E.P. Coffy, Director of F.B.I. Labs. ; Mr. J.H. Anslinger, Commissioner of Narcotics in the Treasury Dept. ; Admiral Charles S. Stephenson of the Navy Bu. of Med. and Surg. ; Col. R.D. Halloran of the Surgeon General's Office; and Lt. Col. R.E. Locker of Military Intelligence Service. Commander Cushing, attached to the N.D.R.C., coordinated the committee. More recently its work has been assisted by Dr. Watson W. Eldridge of St. Elizabeth's Hosp. and Captain George H. White and James A. Hamilton of OSS. Exhaustive review of all relevant pharmacological literature narrowed the field to a half-dozen drugs. Preliminary experiments found attention on some variety of cannabis as the drug of choice. Three varieties of cannabis were studied: Cannabinol from Indian Charis, tetrahydrocannabinol acetate derived from the above, and synthetic cannabinol. Of these, the acetate derivative was found to be preferable. Various routes of administration were explored; oral administration, burning in smokeless charcoal, spraying, and inhalation in cigarettes. Of these, inhalation in cigarettes is the only route which can be recommended at the present time. Standard cigarettes (see attached package) may be loaded with .02 grams of Loewe's acetate. The drug is introduced into the cigarette with a 1/4cc tuberculin syringe and a specially prepared #22, 1/12" hypodermic needle. The level of the latter's point is sanded away to form a blunt, rounded tip which slides easily through the center of the tobacco. Effort is made to achieve an even distribution of the drug through all but ½" at each extremily(sic). The acetate is injected at maximum viscosity compatibel(sic) with delivery from the needle. A dilution with more than 1% with 95% alcohol is required to achieve this viscosity. Cigarettes prepared as above outlined are perfectly normal in appearance and in taste. There is a fairly wide range in individual difference in sensitivity in the drug. Furthermore, there are wide individual differences in inhalation habits. A single cigarette may produce mild but definite effects in one person, while two or three cigarettes, distributed over ½-1 hour may be necessary for other subjects. For subjects who have high tolerance or who inhale only a small amount, two or three additional cigarettes with .02 grams of the acetate should be administered over a period of time - from 1 to 5 hours until the desired effect is obtained. Stronger concentrations may be prepared, but should be used with considerable discretion. Psychological Effects of the Drug When the drug is administered gradually, through one to three cigarettes spread over ½ to 1 hour, the first noticeable effect is a gradual, pleasant sensation of relaxation and well-being. This sensation may be just noticeable 3-10 minutes after beginning the first cigarette, or it may appear during or after the second or third. If the dosage is adequate, this state passes, after a few minutes, into one in which thoughts flow with considerable freedom, and in which conversation becomes animated and accelerated. The subject may experience lapses, - such as forgetting what he was about to say. Frequently, he becomes greatly amused. He may tell funny stories or related personal anecdotes with some abandn(sic) and indiscretion. This stage wears off gradually over a period of one to two hours. For a period of fifteen minutes to a half-hour, during the peak of the effect, the subject may have a slight sensation of constriction in the upper abdomen or lower thorax, or he may be unusually conscious of pulse or viscera. These sensations are not sufficiently marked to interfere with his elation and loquaciousness. If the cigarettes contain two to three times the standard dose of .02 grams, a somewhat different phenomenon may appear. Within five or ten minutes after beginning to smoke, the subject experiences dizziness and difficulty in focusing his eyes on objects. At the same time he may become apprehensive and anxious for more air. He may lose consciousness for a minute or so. If this degree of intoxication is reached, the subject may have no energy to get up from a reclining position for an hour or more, and he may feel stuporous for two or three hours. Summary of Psychological Effects: With some reservations, the effect of tetrahydrocannabinol acetate may be said to resemble that of alcohol. Small amounts produce relaxation and a feeling of well-being. Moderate amounts produce elation, loquacity, euphoria, and irresponsible behaviour(sic). Large amounts produce stupor and lethargy. There is no regular amnesia for events which transpire during the period in which the drug is effective, although memory for details may be blurred. The following points of dissimilarity to alcoholic intoxication should be noted: (1) The drug may be administered, via cigarettes, without the subject knowledge; (2) The tendency toward talkativeness and elation is probably more marked than in alcoholic intoxication; (3) Large stupor-producing doses do not result in nausea or emesis; (4) There are little or no psychological or physiological hangover effects. Evaluation for Interrogation Tetrahydrocannabinol acetate is not a perfect "truth drug" in the sense that it's administeation(sic) is followed immediately and automatically by the revelation of all the secrets which the subject wishes to keep to himself. Indeed, a careful evaluation of the psychological mechanisms involved leads to the conclusion that such a goal is beyond reasonable expectation from any drug. However, the drug does produce a psychological state of relaxation, talkativeness and irresponsibility which might be extremely useful to a skilled interrogator. As with alcohol, a variety of reactions may be anticipated from subject to subject. Although a belligerent or crying "jag" has not been observed experimentally, it would not be unreasonable to expect such a reaction. In the various experiments which have been conducted, an attempt has been made to approximate a real interrogation situation. On several occasions, considerable information has been revealed which probably would not have been divulged without use of the drug. However, no experiment can be expected to duplicate the situation which occurs when enemy prisoners are interrogated, and the final proof of the drug must wait on field testing. It may be feasible to introduce the drug [2 or more subjects] in small quantities when no interrogator is present, and record the conversation which ensues by dictaphone. Precautions to be Observed in Interrogation The interrogator who uses this method must be thoroughly acquainted with the properties of the drug. He must regulate dosage according to the smoking habits of the subjects. He should manipulate the situation in such a way that the subject does not become aware that he has been drugged or is behaving unusually. He must adjust his interrogation to the personality of the subject, and it would probably be necessary to establish rapport over several sessions. It is essential that the subject does not know that he is being subjected to formal interrogation. He should be led to believe that he is engaged in a friendly discussion of matters of common interest. Conclusion: Tetrahydrocannabinol acetate, administered in cigarettes as described above is probably not adaptable for mass interrogation. It might prove exceedingly valuable in extracting special information from key personnel. This can be determined, in the last analysis, only by a field test conducted by an officer who is experienced in subtle undercover interrogation, and who is at the same time familiar with the properties of the drug. While other websites (in fact almost all others) take the Jack Herer  viewpoint on the subject. In other words, that the prisoners under interrogation were laughing so hard they became all but worthless. Some would say they are still laughing at those interrogators to this very day. However, the one related issue that seems to have received very little, if any mention is the fact that Harry Anslinger (the very originator of the Reefer Madness campaign) himself, would even approve of such a use for Cannabis. Granted according to the campaign it was supposed to lower inhibitions, thus making it easier for its victims to go out and commit bestial crimes. But wasn’t Cannabis also supposed to be the “Killer Drug”, the “Assassin of Youth” etc., etc. That its use led to bestial acts of uncontrollable violence etc., etc. NOTE that no mention of this fact (which according to Anslinger, was the gospel truth), was even made mention of in the report. Where is Victor Licata, who was said to have killed five family members under its evil influence? Where are the rest of his gore file cases that showed numerous bestial acts committed under its influence? Thus the very idea of its use (granted it was to be used only on enemy prisoners of war) defies imagination. What if a prisoner turns on his interrogators? Wouldn’t its use, imply more guards just to keep order. The whole idea, assuming that Anslinger really believed in his lies would be preposterous. The only way that it could make any sense was if Anslinger himself knew all along that it was all a lie? As indeed he did. [1B]-- Cockburn, Alexander; Jeffrey St. Clair (1998). Whiteout: The CIA, Drugs and the Press. Verso. pp. 117–118. ISBN 1859841392.